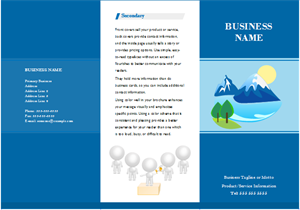 Creating brochure with free templates and examples. Brochure design has never been easier. 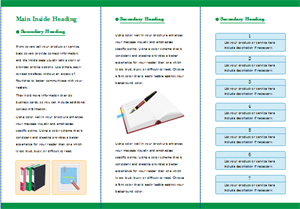 A brochure is a small booklet or pamphlet containing advertising or promotional information, which is mainly used to introduce a company or organization and inform about products or services to a target audience. Brochure can be a single-sheet that is bi-fold or tri-fold. Bi-fold brochures have prints on both sides and are folded into halves. Tri-fold are also printed at both sides but are folded into thirds. Other brochures are "Z-folded" or "C-folded". 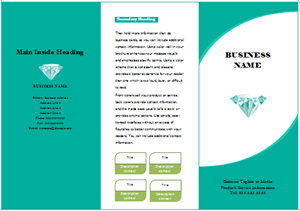 Brochures are effective materials to promote business. Edraw can be used as an excellent brochure maker accompanied with rich templates and illustrations. The drag-and-drop ability makes it easy to layout the design, and with smart guides, you can easily set accurate sizes and margins. The interface is straightforward and handy, with clearly labeled buttons, a library panel for adding shapes and samples gallery for managing examples. 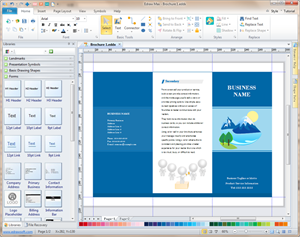 When finish, you can easily export the brochure to PDF, PS, EPS, Office, Html and many other formats to proceed printing or sharing.